Sometimes you start facing a continuous problem with your phone and the situation so arises that you are required to rest your phone to factory to get rid of the annoying problems. The same is the case with every phone OS available, but here we’re talking about Windows Phone. Here’s a guide to help you hard reset your Windows Phone if you’re facing any problem. Note: Once you reset your phone, it will return to the factory settings state and you won’t be able to get back your files/settings or anything, except if you already have a backup. To rest your phone through the interface, follow these steps. These steps are the same for every manufacturer, be it Nokia, Samsung or HTC. Scroll and tap on About. Now tap on reset your phone. This procedure differs from manufacturer to manufacturer. Sometimes the procedure also differs between various models from the same manufacturer. We’ve tried to cover it all here. P.S: If your phone isn’t responding it at all, you can shut it down by soft resetting it. This can be done by holding the power button for over 10 seconds. If you own a Nokia Lumia phone, following are the steps to Hard Reset it. Power down (switch off) your phone. Press and hold (keep them pressed) these buttons – Camera + Power + Volume Down. When the phone vibrates after a few seconds, release the power button, but keep Camera and Volume Down button pressed. Release both of them after around 8-10 seconds. Your phone will be reset. Press and hold the Volume Down button alone. Now press the power button and Release the Volume Down button. An exclamation mark will appear. Press and hold these buttons – Camera + Power + Volume Down. After a few seconds the phone will vibrate. Release the Power Button now, but keep holding the Camera and Volume buttons. Release both the buttons when you see the screen. Tap on the Windows Key twice to confirm the reset. Your phone will now be reset and all data will be deleted. Facing any problem in resetting your phone? Leave your inputs in the comments section below and we’ll try to help you out with your problem. Hi I’ve tried my huawei w1but the screen it’s just blue what can i do? My huawei g7 is not getting charged, it just shows red blink. Then it get turn on for 3 seconds and then again get off. Try using the Recovery Tool to recover it. I’m having a Huawei w1-u00 and it won’t turn on. It gets stuck on some sad face smiley and i can’t reset it to. Can anyone help me out please? Were you able to put it to reset and it failed? Or you’ve not yet managed to put it to reset? If the reset failed, you’d be needed to flash it with factory ROM. I tried to reset it but failed. Please how to i flash it with factory ROM? That’s something you’ll be needed to use Google for. I’ve only experienced with Nokia Lumia phones and there flashing stock ROM is an easy task. My huawei keeps coming on . Something weird happened. Unfortunately, no solutions are available unless you manage to find the full ROM and the flashing software used by Huawei. Better visit the service center. i’m still have a problem to switch my huawei w 1- u00 phone on, it stilla blue screen. I am using Huawei Ascend W1 and I get blue screen (Screen of death) after turining it on. The phone keeps turning itself on and off every 2 to 3 minutes but it never gets past the blue screen. Please help. Seems like a hardware issue. You need to visit their care center for help. Thank you Narender Singh. I will visit their service centre. Thank you, buddy 🙂 Hope the info was helpful. 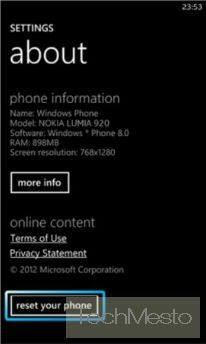 My windows 8 phone has copied my other windows 8 iphone how do i uncopy it ? Couldn’t understand you brother. What do you mean?